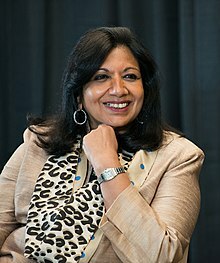 Kiran Mazumdar-Shaw (born 23 March 1953) is an Indian billionaire entrepreneur. She is the chairperson and managing director of Biocon Limited, a biotechnology company based in Bangalore, India and the chairperson of Indian Institute of Management Bangalore. In 2014, she was awarded the Othmer Gold Medal, for outstanding contributions to the progress of science and chemistry. She is on the Financial Times’ top 50 women in business list. In 2015, she was listed as the 85th most powerful woman in the world by Forbes. Forbes again listed her in 2016 and 2017 - the most powerful women in the world at 77th and 71st position respectively. Kiran Mazumdar was born to Gujarati parents in Bangalore, India. She went to school at Bangalore's Bishop Cotton Girl's High School, graduating in 1968. She then attended Mount Carmel College, Bangalore, a women's college offering pre-university courses as an affiliate of Bangalore University. She studied biology and zoology, graduating from Bangalore University with a bachelor's degree in zoology in 1973. Mazumdar hoped to go to medical school, but did not obtain a scholarship. Her father, Rasendra Mazumdar, was the head brewmaster at United Breweries. He suggested that she study fermentation science, and train to be a brewmaster, a very non-traditional field for a woman. Mazumdar went to Federation University (formerly University of Ballarat) in Australia to study malting and brewing. In 1974 she was the only woman on the brewing course, and came top of her class. She earned the degree of master brewer in 1975. After a brief period as a trainee manager at Biocon Biochemicals Limited, of Cork, Ireland, to learn more about the business, Kiran Mazumdar Shaw returned to India. :109 She started Biocon India in 1978 in the garage of her rented house in Bengaluru with a seed capital of Rs. 10,000. Although it was a joint venture, Indian laws restricted foreign ownership to 30% of the company. The remaining 70% belonged to Kiran Mazumdar Shaw. Initially, she faced credibility challenges because of her youth, gender and her untested business model. Funding was a problem: no bank wanted to lend to her, and some requested that her father be a guarantor. A chance meeting with a banker at a social event finally enabled her to get her first financial backing. :156:104:109 She also found it difficult to recruit people to work for her start-up. Her first employee was a retired garage mechanic. Her first factory was in a nearby 3,000-square-foot shed. :154 The most complicated piece of equipment in her lab at that time was a spectrophotometer. As well, she faced the technological challenges associated with trying to build a biotech business in a country with a shaky infrastructure. :156:114 Uninterrupted power, superior quality water, sterile labs, imported research equipment, and workers with advanced scientific skills were not easily available in India at the time. The company's initial projects were the extraction of papain (an enzyme from papaya used to tenderize meat) and isinglass (obtained from tropical catfish and used to clarify beer). :104 Within a year of its inception, Biocon India was able to manufacture enzymes and to export them to the US and Europe, the first Indian company to do so. :156 At the end of her first year, Mazumdar used her earnings to buy a 20-acre property, dreaming of future expansion. Biocon Biochemicals of Ireland was acquired from Leslie Auchincloss by Unilever in 1989.:50 The partnership with Unilever helped Biocon to establish global best practices and quality systems. In 1997, Unilever sold its specialty chemicals division, including Biocon, to Imperial Chemical Industries (ICI). In 1998, Kiran Mazumdar's fiancée, Scotsman John Shaw, personally raised $2 million to purchase the outstanding Biocon shares from ICI. :106 The couple married in 1998, whereupon she became known as Kiran Mazumdar-Shaw. John Shaw left his position as chairman at Madura Coats to join Biocon. He became Biocon’s vice chairman in 2001. In 2004, after seeking the advice of Narayana Murthy, Mazumdar-Shaw decided to list Biocon on the stock market. :114 Her intent was to raise capital to further develop Biocon's research programs. Biocon was the first biotechnology company in India to issue an IPO. :159 Biocon's IPO was oversubscribed 33 times and its first day at the bourses closed with a market value of $1.11 billion,:159 making Biocon only the second Indian company to cross the $1-billion mark on the first day of listing. Mazumdar-Shaw's belief in "affordable innovation" has been a driving philosophy behind Biocon's expansion. Inspired by the need for affordable drugs in less-wealthy countries, she has looked for opportunities to develop cost-effective techniques and lower-cost alternatives. She has also proposed that drug companies be cost-sensitive in marketing to developing countries, so that people can afford the drugs they need, particularly chronic therapies. Mazumdar-Shaw noticed the market potential for statins (cholesterol fighting drugs) early on. When the patent of the cholesterol-lowering drug lovastatin expired in 2001, Biocon got involved in its development. Then they expanded to other forms of statins. Part of her strategy was to enter into long-term supply contracts, establishing a dependable market base over time. Statins soon accounted for over 50 per cent of the company's revenue. The company’s revenue went up from Rs. 70 crore in 1998, to Rs. 500 crore in 2004 when it went public. Biocon continues to expand into new areas. Yeast expression platforms offer a desirable alternative to mammalian cell cultures for the genetic manipulation of cells for use in a variety of drug treatments. Unicellular methylotrophic yeasts such as Pichia pastoris are used in the production of vaccines, antibody fragments, hormones, cytokines, matrix proteins, and biosimilars. Biocon's major areas of research now include cancer, diabetes, and other auto-immune diseases such as rheumatoid arthritis and psoriasis. Because of the high percentage of people in India who chew betel or tobacco, India accounts for eighty-six per cent of oral cancer in the world, known locally as "cancer cheek". Diabetes is prevalent, and people who do not wear shoes are at risk to have a minor scrape or injury develop into gangrene, or "diabetes foot". Biocon is also working on drugs to treat psoriasis, a skin pigment disease which can result in social ostracization. Bio-pharmaceuticals developed include Pichia-derived recombinant human insulin and insulin analogs for diabetes, an anti-EGFR monoclonal antibody for head and neck cancer, and a biologic for psoriasis. Biocon is Asia's largest insulin producer, and has the largest perfusion-based antibody production facilities. As of 2014, Biocon directed about 10% of its revenue into research and development, a much higher proportion than most Indian pharmacological companies. Biocon has filed at least 950 patent applications as a result of its research activity. Mazumdar-Shaw has actively engaged in acquisitions, partnerships and in-licensing within the pharmaceuticals and bio-pharmaceutical area, entering into more than 2,200 high-value R&D licensing and other deals between 2005 and 2010. In 2004, Mazumdar-Shaw started a corporate social responsibility wing at Biocon, the Biocon Foundation. The Foundation focuses on the areas of health, education and infrastructure, especially in rural areas of Karnataka which lack healthcare facilities. Mazumdar-Shaw dislikes the term "philanthropy", believing that it often provides temporary fixes rather than changing underlying conditions. She prefers the term "compassionate capitalist", believing that properly applied business models can provide an ongoing foundation for sustainable social progress. "Innovation and commerce are as powerful tools for creating social progress as they are for driving technological advancement... when they are put to use for social progress, the implementation is a lot cheaper, a lot more people benefit, and the effect is more lasting." In 2015, she joined The Giving Pledge, promising that at least half of her wealth will be dedicated to philanthropy. India does not have organized health care programs such as socialised medicine or government-backed health insurance. Rural areas may have only one doctor for every two thousand people: it is estimated that 70 million people do not have the money to pay for a doctor's visit or for medicine. The Biocon Foundation is involved in numerous health and education outreach programs to benefit the economically weaker sections of Indian society. With Devi Shetty of Narayana Hrudayalaya Hospital, Mazumdar-Shaw has supported the development of Arogya Raksha Yojana (Disease Protection Program/Health Help). Through this program Biocon Foundation establishes clinics to offer clinical care, generic medicines and basic tests for those who cannot afford them. As of 2010, seven clinics each served a population of 50,000 patients living within a radius of 10 km, treating in total more than 300,000 people per year. Clinics organize regular general health checks in remote villages by bringing in physicians and doctors from network hospitals. To improve early detection of cancer, they have trained young women as community health workers, using smart phones to send photographs of suspicious lesions to oncologists at the cancer center. Public health campaigns such as "Queen of Heart" educate people about specific health issues and promote early detection of problems such as cardiovascular disease. The clinics operate on a model of micro-financed health insurance. Biocon provides low-cost drugs, making a negligible profit on a unit basis, but an overall profit on volume due to the participation of large numbers of people. Clinics also use a "subsidised convenience" pricing plan, under which more wealthy patrons pay full price in return for the convenience of scheduling their visits and procedures at desirable times, while poorer patients can obtain cheap or even free services by choosing less desirable times. Doctors and researchers look for opportunities to use cutting-edge technology in ways that will drive down costs and ensure quality of service. The death of her best friend, Nilima Rovshen, and the illnesses of her husband and her mother with cancer, have motivated Mazumdar-Shaw to support cancer research and treatment. In 2009, she established a 1,400-bed cancer care center, the Mazumdar-Shaw Medical Foundation, at the Narayana Health City campus in Bangalore, collaborating with Devi Shetty of Narayana Hrudayalaya. In 2011, she added a center for advanced therapeutics with a bone marrow transplant unit and a research center. Her goal is to create a world-class cancer center. Mazumdar Shaw Medical Foundation is a non-profit organization and has two arms to support its cause, which are Mazumdar Shaw Center for Translational Research and Mazumdar Shaw Cancer outreach program. She funded a multi-year research program by creating the Biocon Cell for Innovation Management with Prasad kaipa at the Indian School of Business in 2009. Mazumdar-Shaw speaks about the importance of improving India's infrastructure,:112 emphasizing the need to address issues such as efficient governance, job creation, and food, water, and health insecurity. In Bangalore itself, Biocon, Infosys and other companies have had a significant impact on the city. These companies attract many scientists who would otherwise go overseas. Once a "pensioner's paradise", Bangalore is now called "the best urban working environment in India". Biocon Park, built in 2005 not far from Mazumdar-Shaw's original office, is a ninety-acre campus with five thousand employees. Outside the developed areas, however, there is still severe poverty. Mazumdar-Shaw is a proponent of good government and infrastructure. She supported the Bangalore Agenda Task Force, an initiative of S. M. Krishna and Nandan Nilekani to improve the city's infrastructure and standard of living. Mazumdar-Shaw is part of the Bangalore City Connect Foundation, a non-profit trust for discussion of civic issues, involving both urban stakeholders and the government. Mazumdar-Shaw is actively engaged in urban reform, partnering with Jana Urban Space Foundation and local government to improve roads. She is also involved in the Bangalore Political Action Committee (BPAC), which reviews and recommends candidates running in elections. After the 2009 flood, Biocon, Infosys and Wipro all committed to rebuilding homes for flood victims in north Karnataka. Biocon committed to building 3,000 houses at a cost of Rs 30 crore. Mazumdar-Shaw is a member of the board of governors of the Indian School of Business and a past member of the board of governors of the Indian Institute of Technology Hyderabad. As of February 2014, Mazumdar-Shaw became the first woman to head the board of governors of the Indian Institute of Management Bangalore (IIMB). She is an independent director on the board of Infosys. As of 2010, Mazumdar-Shaw was named among TIME magazine's 100 most influential people in the world. She is on the 2011 Financial Times’ top 50 women in business list. As of 2014, she was listed as the 92nd most powerful woman in the world by Forbes. In 2015, she had risen to 85th in the Forbes ranking. She was voted global Indian of the year by Pharma Leaders Magazine in 2012. Mazumdar-Shaw is the recipient of several international awards including the Othmer Gold Medal (2014) for outstanding contributions to the progress of science and chemistry, the Nikkei Asia Prize (2009) for regional growth, the ‘Veuve Clicquot Initiative For Economic Development For Asia' Award (2007), Ernst & Young Entrepreneur of the Year Award for Life Sciences & Healthcare (2002), and 'Technology Pioneer' recognition by World Economic Forum (2002). In May 2015 Federation University Australia (formerly the University of Ballarat) named a road in its Mt Helen campus as Mazumdar Drive. Kiran and Shaw attended the opening ceremony. Her work in the biotechnology sector has earned her numerous national awards, including the Padma Shri (1989) and the Padma Bhushan (2005) from the government of India. She was given the Economic Times Award for 'Businesswoman of the Year' in 2004. At the Pharmaleaders Pharmaceutical Leadership Summit she was named "Global Indian Woman of the Year" (2012); she also received the Express Pharmaceutical Leadership Summit Award for "Dynamic Entrepreneur" in 2009. The Indian Merchants' Chamber Diamond Jubilee Endowment Trust's Eminent Businessperson of the Year Award was presented to Kiran Mazumdar-Shaw in 2006 by the Governor of Maharashtra, S. M. Krishna. She also has received the Indian Chamber of Commerce Lifetime Achievement Award (2005), the 'Corporate Leadership Award' by the American India Foundation (2005). and the Karnataka Rajyotsava Award (2002). Mazumdar-Shaw received an honorary doctorate from her alma mater, Ballarat University in 2004, in recognition of her contributions to biotechnology. She has been awarded honorary doctorates from the University of Abertay, Dundee, UK (2007), the University of Glasgow, UK (2008), Heriot-Watt University, Edinburgh, UK (2008) and University College Cork, Ireland (2012). She received an honorary doctorate from Davangere University, India, at its first convocation, July 2013, in recognition of her contribution in the field of biotechnology. ^ "Kiran Mazumdar-Shaw". forbes.com. 20 March 2017. ^ a b "Key Management Team – Profile of Kiran Mazumdar Shaw". Biocon. Retrieved 3 August 2014. ^ a b "How Biocon's Kiran Mazumdar-Shaw battled cancer plaguing her husband & best friend – The Economic Times". Economictimes.indiatimes.com. 24 April 2014. Retrieved 3 August 2014. ^ Srikar Muthyala (29 September 2015). "The List of Great Entrepreneurs of India in 2015". MyBTechLife. Archived from the original on 14 January 2016. ^ "Start-up stories: Kiran Mazumdar-Shaw". BBC. Retrieved 5 March 2013. ^ "Kiran Mazumdar-Shaw replaces Mukesh Ambani as IIM Bangalore chairperson". Financial Express. 19 February 2014. Retrieved 3 August 2014. ^ a b "Othmer Gold Medal". Science History Institute. Retrieved 12 June 2014. ^ "Dr Kiran Mazumdar first Indian to receive 'Othmer Gold Medal 2014'". BioSpectrum. 16 May 2014. Archived from the original on 19 May 2014. Retrieved 12 June 2014. ^ Laranang-Mutlu, Theresa (16 May 2014). "USP Congratulates Kiran Mazumdar-Shaw, Recipient of 2014 Othmer Gold Medal". U.S. Pharmacopeial Convention. Retrieved 12 June 2014. ^ "Biocon chief Kiran Mazumdar-Shaw receives Othmer Gold Medal 2014". The Economic Times. 19 May 2014. Retrieved 12 June 2014. ^ Gussman, Neil (19 May 2014). "CHF Presents Awards to Innovators from Around the World at Heritage Day 2014". MarketWatch: The Wall Street Journal. Retrieved 12 June 2014. ^ a b "Women at the Top: 37. Kiran Mazumdar-Shaw". Financial Times. 15 November 2011. Retrieved 29 June 2014. ^ a b "World's Most Powerful Women". Forbes. Retrieved 23 December 2015. ^ "World's Most Powerful Women". Forbes. Retrieved 2018-02-25. ^ a b Babu, Venkatesha (12 March 2006). "The Importance Of Being Kiran Mazumdar-Shaw". Business Today. Retrieved 16 September 2014. ^ Manjunath, V.S. ; Nagendra, S. (2010). Entrepreneurship and Management. India: Pearson Education. p. 154. ISBN 9788131732502. Retrieved 16 September 2014. ^ a b c "Kiran Mazumdar-Shaw". World Economic Forum. Retrieved 16 September 2014. ^ She did not receive a M.Sc. or Ph.D. in 1973. She has been given a number of honorary degrees since then. ^ a b c d e "Kiran Mazumdar-Shaw". Science History Institute. Retrieved 20 March 2018. ^ a b c Campbell, Di. "Dr. Kiran MAZUMDAR-SHAW Brewer and biotechnologist, BCAE Student, 1974 Recipient of a University of Ballarat Honorary Doctorate (2004)". Federation University Australia. Retrieved 17 September 2014. ^ a b c "Biocon Annual Report 2010". Biocon. Archived from the original on 7 August 2014. Retrieved 3 August 2014. ^ a b c d e f g h i j k l m n Krishnan, Janaki (2013). Breaking barriers : success stories of India's leading businesswomen. Ahmedabad: Jaico Pub. House. ISBN 978-81-8495-395-4. ^ a b c d e f g h Pota, Vikas (2010). India Inc.: How India's Top Ten Entrepreneurs are Winning Globally. London, Boston: Nicholas Brealey Publishing. p. 103. ISBN 978-1-85788-524-8. ^ a b c d e f g h i j k Leading, Sudha (2010). Leading ladies : women who inspire India (1st ed.). Mumbai: Fortytwo Bookz Galaxy. ISBN 978-81-908411-8-4. ^ "$800 million biotech business started in a garage". CNN. Retrieved 10 January 2013. ^ a b "Big Shot in Bengaluru". Forbes. 18 October 2004. Retrieved 18 September 2014. ^ a b "History Live: Building a Global Biotech Enterprise". Science History Institute. Retrieved 20 March 2018. ^ "Quiz India's mother of invention". CNN/Asia. 28 November 2008. Retrieved 22 September 2014. ^ "Need To Change Mindset: Kiran Mazumdar Shaw". Bloomberg TV. ^ "Power Women #92 Kiran Mazumdar Shaw". Forbes. October 2013. ^ Balasubramanian, S. (2007). The art of business leadership : Indian experiences. Los Angeles: Response Books. ISBN 978-0-7619-3587-2. ^ a b Ghose, T.K. ; Ghosh, P. (2003). Biotechnology in India. Berlin: Springer. ISBN 978-3-540-00563-6. Retrieved 18 September 2014. ^ Fernando, A.C. (2009). Business Ethics An Indian Perspective. Chennai: Prentice Hall. ISBN 978-8131711736. Retrieved 18 September 2014. ^ Hiscock, Geoff (2008). India's global wealth club : the stunning rise of its billionaires and the secrets of their success. Hoboken, N.J.: Wiley. p. 226. ISBN 978-0-470-82238-8. Retrieved 18 September 2014. ^ Amarnath, Nischinta; Ghosh, Debashish (2005). The voyage to excellence : the ascent of 21 women leaders of India Inc. Delhi: Pustak Mahal. p. 67. ISBN 978-8122309041. Retrieved 18 September 2014. ^ a b c d e f "India: Biocon". Estudio AGML. Retrieved 18 September 2014. ^ a b c Weidmann, Bhavana (4 January 2014). "Healthcare Innovation: An Interview with Dr. Kiran Mazumdar-Shaw". Scitable by Nature Education. Retrieved 22 September 2014. ^ Rios, Maribel (1 June 2012). "A Decade of Microbial Fermentation". BioProcess International. Retrieved 22 September 2014. ^ "Biocon to launch psoriasis drug novel biologic in July". The Indian Express. 28 April 2013. Retrieved 24 September 2014. ^ a b c d e f g Levy, Ariel (2 January 2012). "Drug Test Can one self-made woman reform health care for India, and the world?". The New Yorker. Retrieved 23 September 2014. ^ a b c d Raghunathan, Anuradha (10 June 2013). "Heroes Of Philanthropy: Kiran Mazumdar-Shaw's Affordable Health Care Legacy". Forbes Asia. Retrieved 17 September 2014. ^ "KGI Welcomes India's Leading Biotech Executive". Keck Graduate Institute. 11 June 2010. Archived from the original on 24 September 2014. Retrieved 22 September 2014. ^ "A Woman's Dream Come True (Interview)" (PDF). Asia Pacific Biotech News. 11 (14): 1011–1015. 2007. Retrieved 22 September 2014. ^ a b c d e Singh, Pritam; Bhandarker, Asha (2011). In search of Change Maestros. Los Angeles: Sage. p. 402. ISBN 9788132105862. Retrieved 17 September 2014. ^ a b c d Read, Stuart; Wiltbank, Robert (February 2013). "HEALTHY CHANGE How one social entrepreneur creates progress and profits". British Airways Business Life. Retrieved 23 September 2014. ^ "Kiran Mazumdar-Shaw, Herbert and Nicole Wertheim Join Giving Pledge". Philanthropy News Digest. 17 December 2015. Retrieved 4 February 2016. ^ a b c Kamdar, Mira (2008). Planet India : the turbulent rise of the world's largest democracy (Paperback ed.). London: Pocket. pp. 253–260. ISBN 978-1-84739-077-6. Retrieved 23 September 2014. ^ "Arogya Raksha Yojana Trust". Retrieved 23 September 2014. ^ "Biocon Foundation – Social impact through sustainable community development". Biospectrum. 22 October 2013. Archived from the original on 9 November 2013. Retrieved 24 September 2014. ^ "Biocon puts the spotlight on heart disease in women via 'Queen of Heart' campaign". PharmaBiz.com. 1 August 2013. Archived from the original on 24 August 2013. Retrieved 23 September 2014. ^ "500-bed Mazumdar Shaw Cancer Centre provides hope". The Times of India. 18 July 2009. Retrieved 23 September 2014. ^ "New facility opened at Bangalore's Mazumdar-Shaw Cancer Center". DNA India. 7 May 2011. Retrieved 23 September 2014. ^ "Biocon Foundation Launches 'Chinnara Ganitha'". Biocon Foundation. 21 September 2006. Archived from the original on 4 March 2016. Retrieved 24 September 2014. ^ "Biocon to invest in cell for innovation at ISB". Business Line. 9 June 2009. Retrieved 23 September 2014. ^ Panthry, Pallavee Dhaundiyal (14 June 2009). "Biocon helps ISB students bring home the bacon". The Economic Times. Retrieved 23 September 2014. ^ "Dr. Kiran Mazumdar Shaw inaugurating MBA Program". Amruta Institute of Engineering and Management Sciences. Retrieved 24 September 2014. ^ Mazumdar-Shaw, Kiran (8 April 2014). "Kiran Mazumdar Shaw on 5 reasons why BJP's manifesto stands apart". The Economic Times. Retrieved 24 September 2014. ^ a b Heenan, David (2005). Flight capital the alarming exodus of America's best and brightest (1st ed.). Mountain View, Calif.: Davies-Black Pub. p. 113. ISBN 978-0-89106-202-8. ^ a b Aravind, Indulekha (6 December 2013). "Kiran Majumdar Shaw, the city crusader". Business Standard. Retrieved 24 September 2014. ^ "Right time for action plan to fulfil dreams: Narayana Murthy". The Economic Times. Retrieved 3 February 2013. ^ "BPAC agenda for better city governance unveiled". New Indian Express. ^ "Infosys, Wipro, Biocon to generously contribute for flood relief works". Mangalorean. 9 October 2009. Archived from the original on 15 October 2014. Retrieved 24 September 2014. ^ "Flood Relief: Infy, Biocon, Wipro to rescue K'taka". One India News. 9 October 2009. Retrieved 24 September 2014. ^ Executive Board, KnowISB – Indian School of Business (ISB). Isb.edu. Retrieved on 17 July 2012. ^ "Board of Governors (Past)". IITH. Indian Institute of Technology, Hyderabad. Archived from the original on 20 February 2015. Retrieved 17 September 2014. ^ "Mukesh Ambani quits, Kiran Mazumdar-Shaw to head IIM-Bangalore board". The Times of India. 19 February 2014. Retrieved 17 September 2014. ^ "Dr. Kiran Mazumdar Shaw is Chairperson of Board of Governors at IIM Bangalore". Indian Institute of Management Bangalore (IIMB). Retrieved 17 September 2014. ^ "Board of Governors: Indian Institute of Management Bangalore". Iimb.ernet.in. 11 February 2009. Retrieved 3 August 2014. ^ Limited, Infosys. "Infosys - Management Profiles - Board of Directors". www.infosys.com. ^ Armstrong, Lance (29 April 2010). "The 2010 TIME 100: Kiran Mazumdar-Shaw". TIME Magazine. Retrieved 17 September 2014. ^ "The World's 100 Most Powerful Women". Forbes. Forbes. Retrieved 26 June 2014. ^ "Biocon Chief Dr. Kiran Majumdar Shaw & NMC Chief Dr B.R.Shetty Declared Global Indian Of The Year | Pharmaleaders TV". pharmaleaders.tv. Retrieved 4 February 2016. ^ Sengupta, Paula; Sharma, Sonia. "Kiran Mazumdar Shaw awarded the prestigious 'Nikkei Asia Prize' 2009 for Regional Growth". Biocon Limited. Retrieved 11 May 2009. ^ "Nikkei Asia Prize for Kiran Mazumdar Shaw". The Hindu Business Line. 13 May 2009. Retrieved 17 September 2014. ^ Darpan, Pratiyogita (July 2009). "Nikkei Asia Prize won by Kiran Mazumdar-Shaw". Pratiyogita Darpan: 24. Retrieved 17 September 2014. ^ "Kiran Mazumdar-Shaw awarded the 'Veuve Clicquot Initiative For Economic Development For Asia'". Evaluate. Press Release. Retrieved 16 October 2007. ^ "EY Building a Better World: Past Winners". Ernst & Young. Archived from the original on 27 September 2014. Retrieved 17 September 2014. ^ a b Seijts, Gerard (2013). Good Leaders Learn: Lessons from Lifetimes of Leadership. New York: Routledge. p. xxv. ISBN 978-0-415-65976-5. Retrieved 17 September 2014. ^ "Kiran Mazumdar-Shaw: Businesswoman of the year". Economic Times. 18 October 2004. Retrieved 17 September 2014. ^ "Aanjaneya Lifecare Bagged Coveted BSE Award for Best Return to Investors, Padmashree Dr Mukesh Batra is Business Leader of the Year, Dr Mukesh Hariawala as India's Most Admired Surgeon & Thirty Three top Asia Pharmaleaders Felicitated". Business Wire India. 22 September 2012. Retrieved 17 September 2014. ^ "Pharmaleaders 5th Annual Pharmaceutical Leadership Summit & Awards 2012". Satya Brahma. Retrieved 17 September 2014. ^ "Kiran Mazumdar is 'Eminent Businessperson'". The New Indian Express. 25 February 2006. Archived from the original on 13 December 2010. Retrieved 17 September 2014. ^ "Kiran Mazumdar gets ICC lifetime award". The Hindu. 6 September 2005. Retrieved 17 September 2014. ^ "Dr. Kiran Mazumdar-Shaw Awarded The Corporate Leadership Award". MoneyControl. Retrieved 17 September 2014. ^ "Award for Biocon CMD". The Hindu Business Line. 11 October 2005. Retrieved 17 September 2014. ^ "Rajyotsava Award for Nilekani". The Hindu Business Line. 31 October 2002. Retrieved 17 September 2014. ^ "Exploration, higher education, biotechnology, and business strategy honoured at Abertay graduations". Abertay University. 2 July 2007. Retrieved 17 September 2014. ^ Fitzpatrick, Patrick (8 June 2012). "Dr Kiran Mazumdar-Shaw, Degree of Doctor of Science Introduced by Professor Patrick Fitzpatrick, Head of the College of Science, Engineering & Food Science, UCC". University College Cork, Ireland. Retrieved 17 September 2014. ^ "Davangere varsity maiden convocation on July 27". The Hindu. 26 July 2013. Retrieved 17 September 2014. Wikimedia Commons has media related to Kiran Mazumdar-Shaw. This page was last edited on 14 March 2019, at 06:16 (UTC).